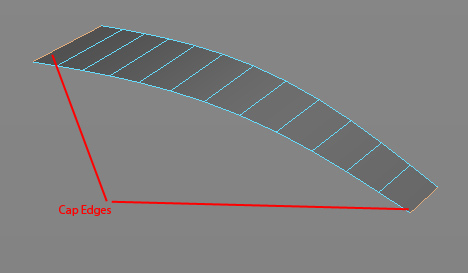 As a part of tools for work with polygon hairs i created small script to select cap edges of poly stripes. The task was: create script which converts any selection (poly object, poly vertices, poly edges or poly faces) to edges which lie on the caps of poly stripes. # Check if vertices or faces were selected. # If True convert selection to edges. # Create variable of special class MScriptUtil. # It's required to store pointer to integer variable. # Create variable "resultSelection" of type MSelectionList to store cap edges. # Create variable "selection" to store current selection. # Fill "selection" with list of selected objects. # Create iterator through list of selected objects. # Create variable to store iterating edge as MObject. # Create variable to store pointer to interger value. # Variable to store currently iterating object as MObject. # Main loop of selection iterator. # Create iterator through SELECTED edges, if edges are in selection. # becouse object is selected, but not components. Hey there. I just came by this and realised there are no comments. However, this still seems to be the best example out there on how iterators actually work. Great Job dude. Thank you!